I would like to say a few words about weddings. I've just been through one. Not my own, my daughter's. Someday in the far future, I may be able to remember it with tender indulgence, but not now. I always used to think that marriage was a simple affair. Boy and girl meet, they fall in love, get married, they have babies. Eventually the babies grow up, meet other babies, and they fall in love and get married, and so on and on and on. Looked at that way, it's not only simple, it's downright monotonous. But I was wrong. I figured without the wedding. 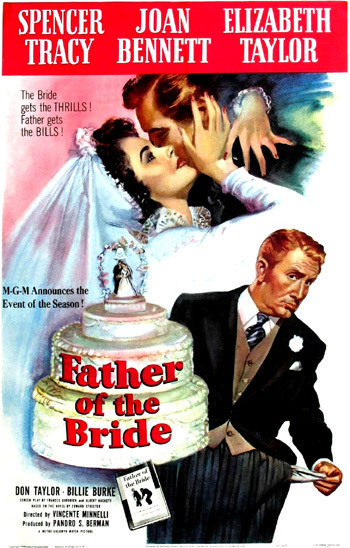 He tells the story of his beautiful daughter Kay's (Elizabeth Taylor) announcement of her engagement and all the ceremonial requirements and events leading up to the wedding over a period of three months. - the engagement party where he is advised "from now on, your only function is to pay the bills." - creating the guest list and negotiating with the caterer for the event, "An experienced caterer can make you ashamed of your house in fifteen minutes." - the midnight snack kitchen scene with Kay ("Kitten") and her "Pops" over a bottle of milk where she tells him, "Nothing ever fazes you, does it?" What's it going to be like to come home and not find her. Not to hear her voice calling 'Hi Pops' as I come in. I suddenly realized what I was doing. I was giving up Kay. Something inside me was beginning to hurt. Kay gives him one last adoring look as she comes down the aisle after the ceremony. And Pops, you've been just wonderful. I love you. I love you very much. Bye bye. Nothing's really changed, has it? You know what they say: 'My son's my son until he gets him a wife, but my daughter's my daughter all of her life.' All of our life.